This Campaign Page is for the Beyond Razor Coast campaign. Leave Comments here to talk to your fellow players! When we left our intrepid heroes, all hell had broken loose in Port Shaw, as an ancient terror — the Krakenfiend — rose from the depths as hordes of sahuagin bubbled forth from the shore. The town thrown in chaos, the colonists and native Tulita joined arms, only to fall back before the savage tide. Nlishgar/Garnlish, Sarisa, Kelnar, Gwenelyth, and a stranger named Zeno banded together to repel the fell demon, but they met their match in the flying, tentacled horror. With a leathery appendage, the Krakenfiend picked up Nlishgar/Garnlish and inserted the wriggling dwarf into its gaping maw. Satisfied, it proceeded to The Lodge, the colony’s seat of government, and settled inside its walls, its tentacles jealously enclosing it. You and your party must save Port Shaw, thwart other evils, and sail the high seas for wealth and glory! 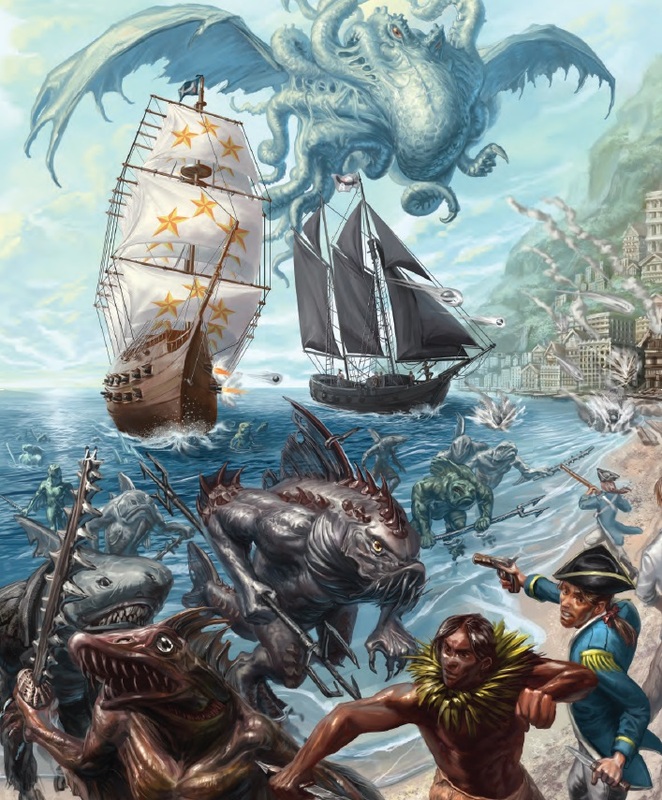 In addition to the Pathfinder Core Rules, we will also use Frog God Games’ options in the Razor Coast Freebooter’s Guide and rules for ships and ship warfare in Razor Coast: Fire As She Bears! Level 11 characters: Armor attunement +2 (enhancement bonus to armor), Deflection +2 (deflection bonus to AC), Mental prowess +4 (enhancement bonus to one mental stat), Physical prowess +2 (enhancement bonus to one physical stat), Resistance +3 (resistance bonus to all saves), Toughening +1 (enhancement bonus to natural armor), Weapon attunement +2 (enhancement bonus to a weapon). WEALTH: New characters will have somewhere between 41,000 and 70,000 in wealth, depending on your starting XP. Returning players can elect to keep their current equipment instead. KEEP IN MIND: If you want to sail the high seas, you will want to be skilled in Profession (sailor), and if a character captains the ship then Charisma is useful for having a strong and loyal crew.